The Bhatti Eye Clinic is situated in the green leafy Mumbai ( Bombay) suburb of Chembur-Deonar.It is conveniently located just off the Mumbai Pune Highway opposite the Deonar BEST Bus Depot. 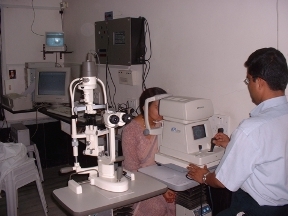 The clinic is equipped with state of the art instrumentation for the diagnosis and treatment of various eye disorders like cataract,refractive errors,glaucoma,squint and retinal diseases.It has a tradition of employing best of breed practices to prevent and treat a comprehensive array of eye conditions.Treatment of cataract by all surgical modalities including phacoemulsification, is the forte of the Bhatti Eye Clinic. Besides surgical and laser treatment, the optical shop at the Bhatti Eye Clinic also dispenses spectacles (eye glasses) scientifically fitted with the maximum precision possible.